This 276,000 cubic metre high bay warehouse was designed, made and erected by REIDsteel for the automated storage, co-packing and distribution of consumer products. It has the span of 106m, is 155m long and has a clear internal height in excess of 17m, containing robotic storage and retrieval cranes and racking, and substantial goods in and out areas. At one end, the robotic system feeds a 2 storey processing and dispatch zone. Each area was a building itself; but with the added complication of them all interlinking with each other; and with conveyer systems passing between them. This area presented a unique problem: the dispatch area at ground level had to be long, wide, high and clearspan, (106m x 25m, 10m) so that trucks and forklifts could operate without hitting any columns. But: the co-pack area above this had to carry huge loads, moving machinery and extremely delicate weighing in equipment, which could not tolerate deflection or vibration. REIDsteel's solution was 25m clearspan portals make from the heaviest beams made, and even these beams heavily haunched up the columns and across the span: probably the biggest such mezzanine ever built. Each frame, spaced slightly differently to avoid resonance, needed 328 bolts each weighing 3 kilograms. The remaining area of the building, 106m span by 131m long, was designed as an economical propped portal structure and houses the entire Automatic Storage and Retrieval (ASAR) racking system for 40,000 pallets. The building incorporates a vast array of services including a temperature control system maintaining an ambient temperature range between 5oc and 22oc, and a high specification sprinkler system to meet Factory Mutual insurer standards. REIDsteel also designed, made an erected the first floor level, 80m long, covered bridge, 5m wide x 5m high internally, with 3 support towers, to carry two conveyor systems linking the dispatch area of the new building to an existing warehouse. Not only did REIDsteel work closely with the client and architect but also had to work as a close team with the mechanical engineers, the conveyor and racking engineers, the electrical engineers and fire engineers. REIDsteel provided and erected as part of the main building, duct supports steelwork and service apertures, conveyor platform and supporting steelwork, electrical cable steel support systems and tramlines of supporting steel for the sprinkler system. Having this ready in place before the fit-out ensured speedy and efficient installation. REID even plotted some of the complicated ductwork in their 3-D model to ensure a safe passage around the maze of steelwork. It was far easier to view it in 3-D than it was in a traditional 2-D CAD package. 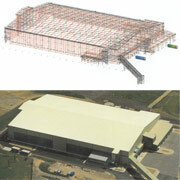 About 8,000 hours of design and drawing work were needed to take the project from an empty field in January 2004 to the completed and clad structure in September 2004. REID's draughtsmen were often at work by 5:30am daily including some weekends. They were even seen working over Christmas. The site has to be piled throughout, therefore cranes could not be used on the piled areas lest their weight crack the pile caps, so the entire structure had to be erected using a small fleet of cranes outside the building footprint, including 500 and 300 tonne mobiles and two 200 tonne tracked crawler cranes with 72m jibs. REID's workforce in highly trained and certified and, in line with company policy, they designed integral safety systems in the structure, incorporating safety netting and Mobile Elevation Equipment to achieve all bolted connections. REID's built in roof access systems and permanent roof edge fencing for protection during construction, means that no expensive access or protection systems need be employed for future maintenance. The 1,200 tonne steel structure used 55,000 bolts (11 tonnes) and required 30,000m2 of cladding, plus 20kms of beams and box section, 27kms of purlins and 4.6kms of bracing. REID also provided 20 flights of stairs, 20 sectional doors, 5 dock levellers, 5 fire roller shutters, 4 rapid rolling crash-out doors and a dozen personnel, fire doors and glazed doors. REID used over 2.1kms of stainless steel wire rope on the roof edge protection. They also designed and provided 7 docking platforms and gates, as well as 8 runs of cat ladders to allow access for both plant and personnel in the roof areas. REID also made and fitted all the aluminium windows and curtain glazing. The whole project was finished on budget and on time.